The Samsung Galaxy Note5 was officially announced today by the company, earlier than their usual September IFA announcement. It seems the company is set to getting their own large screen device out to the public ahead of Apple this year. The brand new Note adopts the new design which Samsung debuted on the Galaxy S6, with a metal frame sandwiched between two pieces of toughened glass. You also get the signature Note features like the S Pen, which includes improved functionality and usability. With the switch to the premium design, Samsung has had to make some sacrifices, including the lack of microSD storage, and a non-removable battery. In terms of design, you get a 5.7 inch Quad HD Super AMOLED display, 32GB of internal storage, a 16 megapixel rear camera, a 5 megapixel front camera, and a 14nm octa-core Exynos 7420 processor with 4GB of RAM. The new Galaxy Note5 offers Samsung's brand new design language, first seen in the Galaxy S 6. The plastic has been replaced with glass and metal for a more premium feel, offering a metal frame sandwiched between toughened glass panels. Customers will be able to select between the black and white versions of the Note5 at launch. Because of its large size, Samsung has given the phone a slight curve on the back, which makes it easier and more comfortable to hold and use the device with one hand. The button layout has not changed since the Galaxy S6: you have a large physical home button on the front below the display, along with a capacitive multitasking key on the right and a back key on the left. The home button doubles as a fingerprint scanner, but has been updated with a touch gesture instead of the swipe gesture. The remaining physical buttons are on the side: the power/lock key on the right hand side, and the volume rocker on the left. These buttons offer a premium metallic finish which goes well with the device. The glass back of the device is still very reflective, much like the one on the Galaxy S6. Fortunately its not slippery and doesnt affect the grip on your device. On the downside, it does act as a fingerprint magnet and can get messy really quickly. The Note5 also supports wireless charging, and you'd need to buy a separately sold Qi wireless charging cushion in order to use that. The big highlight and signature feature of the Note5, however, is without a doubt the stylus. It is located on the bottom right of the phone, and rather than having to manually pull it out, you can now just slightly push it and it will pop out slightly via a spring-loaded mechanism. While this is a small touch, its a welcome addition to the overall user friendliness of the device. The Galaxy Note5 features a 5.7 inch Quad HD Super AMOLED panel, which has a resolution of 1440 x 2560 pixels and a 518ppi of pixel density. While the panel may not be as sharp as the 577ppi on the Galaxy S6, the Note 5 still offers one of the sharpests displays in the market. The Samsung Galaxy Note5 features a 16-megapixel rear camera with optical image stabilization (OIS), while a 5-megapixel is packs in front to take care of your selfies and video calls. The rear camera still protrudes slightly on the back of the phone. In terms of optics, you now have impressively wide, f/1.9 lenses on both the rear and front cameras. Such a wider lens allows more light in and is a big theoretical advantage for low light shots. The camera app is largely the same solution as on the Galaxy S6 with two modes being the big highlight: the auto mode that is self explanatory and the manual 'Pro' mode. The latter can now also control shutter speed on the Note5, for a truly full manual ride. Naturally, the 'Quick Launch' shortcut - double clicking the home key to start the camera app from anywhere - works on the Note5. Battery life has become such a critical aspect of a smartphone that all eyes are on it when a new phone launches. The new Galaxy Note5 features a reasonably large, 3000mAh battery that - interestingly - is smaller than the 3220mAh battery pack used in the Galaxy Note 4. The smaller battery could be one of the things that made it possible for this to be a noticeably thinner phone than the Note 4, and with the advances in Super AMOLED technology and the much more power-efficient 14nm system chip, we expect battery life to remain on par, or even slightly higher than that in the Note 4. The new Note5 also supports wireless charging out of the box and Samsung's very efficient rapid charging technology. The battery itself, however, is not user-removable. The Samsung Galaxy Note5 ships with the latest Exynos 7420 system chip, a piece of silicon made using the industry-leading 14nm FinFET process in Samsung's foundries. While others are still working towards mass producing 14nm non-planar chips in the phone space, Samsung has already delivered with the Galaxy S6, and now again leverages this advantage in its new phablet. The Exynos 7420 is an octa-core chip with four Cortex A57 cores running at up to 2.1GHz, and four more power-efficient A53 cores clocked at up to 1.5GHz. The Galaxy Note5 is also the first Samsung phone to come with the plentiful, 4GB of RAM of the fast LPDDR4 variety. 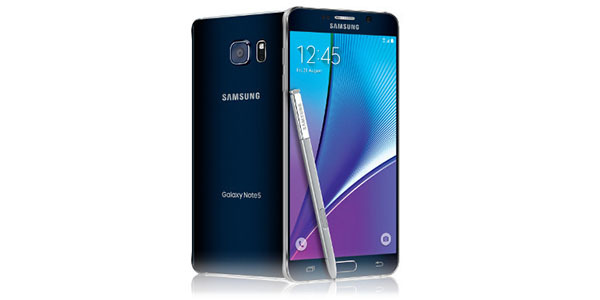 The Galaxy Note5 features 32GB of internal storage in the base model of the Note5. The increase in storage is a natural transition with Samsung opting to leave out microSD in favor of their premium design. There will also be a 64GB model on sale in the United Sates, and both versions will feature high-speed UFS 2.0 storage. On the connectivity side of things, the Galaxy Note5 supports 4G LTE with a staggering amount of bands and peak downlink speeds of up to 620Mbps. It's also got MIMO (2x2) antennas for improved reception and dual-channel Wi-Fi, as well as NFC, Bluetooth 4.2 with support for the low energy profile, and positioning via GPS, Glonass, and the Beidou systems. There is a big overhaul in the beautiful cartoony land of TouchWiz: it's been redrawn with a new icon style and it's further optimized to run smoother and minimize that well-known 'TouchWiz' lag. The new icons look largely familiar to the old ones, but now they have a solid color background with rounded edges, an effect that reminds us of good old Symbian/MeeGo days. The new S Pen also comes with a host of new software features. One particularly neat new one is the option to jot down notes right from the lockscreen: just pop out the stylus and start writing without opening any apps or even unlocking the phone. You also have more accurate stylus input with less of an input lag, and the sheer amount of things that you can do with the S Pen is expanded: you can take screenshots, write annotations, quick launch apps, and more. The new 'Air Command' has expanded functionality as well, as the icon now hovers and grants one-tap, instant access to all S Pen tools from any screen at any time. The other big news around the Galaxy Note5 is that it will be the first phone to launch with the new Samsung Pay solution. Samsung Pay will debut in the United States in September and will work in practically all places, where you can use your card. This new payment system can work both via Magnetic Secure Transmission (MST) or Near-Field Communications (NFC). Samsung is guaranteeing the safety of transition via a triad of features: KNOX encryption, fingerprint security and digital tokenization. Samsung will make the Galaxy Note5 available for purchase as early as today, allowing customers to pre-order the device today at 3pm ET. Official sales in the Unites States start in just a week, on August 21.